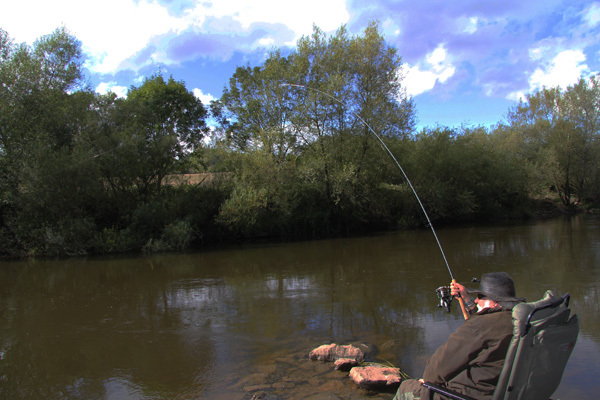 Paul had phoned me to say about fishing the river Wye with two of his mates, Jeff and Geoff. He arranged to be guided for two days on two beats and then for them to give it a go on their own. So we met on the Monday morning at 6.30 just as it was getting light. The weather had promised to be fair with little rain. However the Wye valley had other idea’s. The temperature was 15c early in the morning and humidity very high. First stop was to show Jeff his beat and where the fish normally lay. He was going to roll meat around the swim to see what he could pick up. Geoff and Paul headed towards another beat where two could just about fish together. Light rain came and went during the first half of the morning. The river had risen a good 8” since I had been there 4 days earlier however I’m not sure where the rain fell as there was not a hint of it on the EA pages? Anyway the two were using the trusty feeder and pellet approach. They were both fishing different parts of the swim and it was Geoff who started the ball rolling with 3 barbel quite quickly. Two were small little fish of 4lbs and another of just over 7lbs. Now it was very interesting as Paul was the bottom rod in the swim and this is were you normally pick up first. However Geoff seemed to be on them with the upper part of the swim. Paul though soon joined the action with a 6lb barbel. Things went quiet for a while which is normally the case around midday. 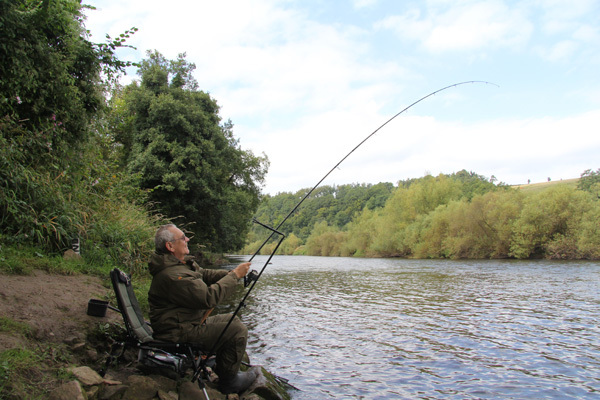 However at 4pm Paul had a 3ft twitch on his rod and soon he was fighting a large barbel that lead him a merry dance up and down the river. The bigger fish tend to plod around and hug the bottom. This fish seemed to be doing just this. 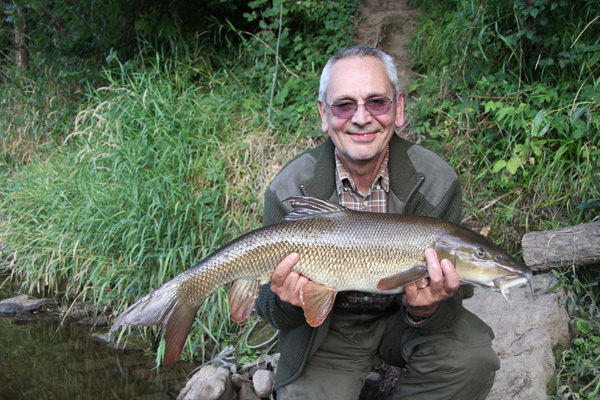 Paul did very well to land the barbel from his position. It looked really big in the net and I said it’s a double figure fish. Well it was 10lbs 11oz and a pb for Paul. To say Paul was excited would be an understatement. I think he would of packed up and gone home a happy man there and then. Geoff soon chipped in with a nice chub of 4lbs 10oz and then 3 barbel on the bounce all in a 45 min. The pick of the barbel weighed in at 9lbs 4oz and a new pb for him. The grin on his face says it all really. 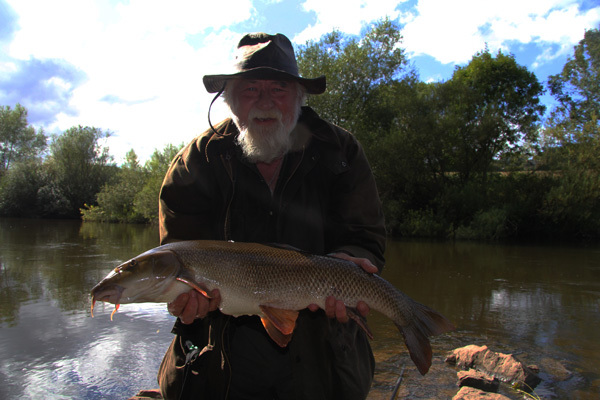 Paul was then on the barbel throne with two nice fish of 7lbs and an 8lb 10oz fish. He went on to lose another big fish. Geoff though still wasn’t finished two more chub of about 4lbs and two other barbel of 6and 7lb made it a very interesting day. Poor Jeff had struggled on the other beat with his rolling meat method. He lost lots of tackle in the afternoon and only had 3 small chub to show for his efforts. So 13 barbel between Geoff and Paul was a great result. Paul and Geoff had persuaded Jeff to fish with pellet in the same swim as Paul and Geoff had fished the previous day. Geoff though was going to fish the beat where Jeff struggled on the previous day. 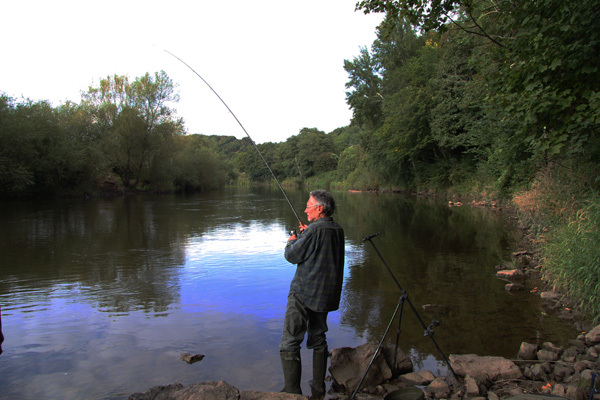 I spent some time with Geoff showing him the swim and where the barbel lay. I wished him good luck and went back to Paul and Jeff. 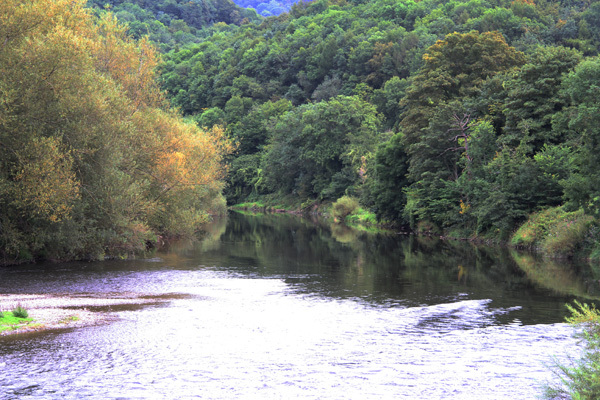 The Wye looked great in it’s late summer colours. The river had dropped together with some of the colour. The fishing became more difficult. 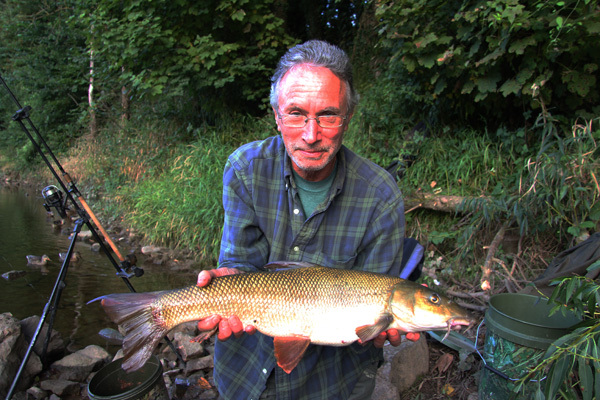 Paul was the first away with a very nice barbel of 6lbs 8oz followed by another 5lber. Poor Jeff was fishing the upper part of the swim but only managed a chub. 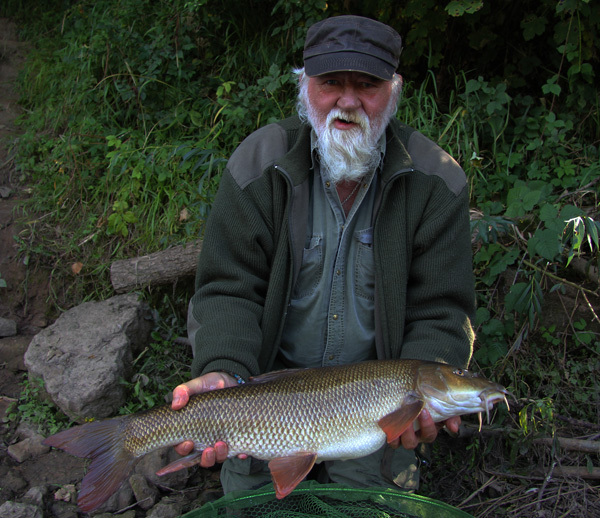 Paul was soon on the barbel throne again and this barbel gave him a real run for his money. At one point something got stuck between some rocks. I tried and tried for 10 minutes or so to free it however it just wouldn’t budge. I tried from a great heigh and took the rod way downstream but nothing. So I was taking the rod back up to Paul when I gave it one more chance with slack line and hey ho out it came. The thing with these barbel, you need where ever possible to keep them out of the rocks and off the bottom. It felt a great fish and proved to be so at exactly 10lbs. Very very lucky to get that fish. Jeff came back to say that Geoff had caught a few chub but had 7 barbel to 6lbs plus. It was Jeff’s turn next in landing a very nice 6lb barbel. Paul then lost another good barbel to the rocks again. Then Jeff did likewise. I think they under played the fish you need to keep them high in the water. Jeff though had the last barbel of the day at 7lbs 6oz and I was really pleased for him. So that was it pretty well. However just as we were packing up Geoff came to see us have had a fantastic days barbel fishing 18 with the largest going 8lbs 12oz. Oh and a few chub! The next day they reported back to me that Paul caught one barbel for the day, however the other two fishing the other beat caught 29 barbel Geoff had 14 barbel and Jeff just beat him having 15. Plus they had a good few chub too. So 3 great days fishing for the three Guy’s one they will not forget for a long time. This entry was posted on Tuesday, September 9th, 2014 at 8:51 am	and is filed under Uncategorized. You can follow any responses to this entry through the RSS 2.0 feed. Both comments and pings are currently closed.